The book has 250 double column pages, and 14 illustrations. It is edited and mostly written by Simon Fairlie, with chapters by Simon Ruston (Travellers), Erica Thompson (Wales) and Cathy Ashley (Scotland). There is also considerable input to several chapters from a former appeal Inspector who wishes to remain anonymous. It is available at a reduced price of £20 if you pay by cheque, postal order or cash (cheques made out to Simon Fairlie), sent to Simon Fairlie, Monkton Wyld Court, Charmouth, Bridport, DT6 6DQ. Please include your name, address and phone number or email. Understanding the mentality • An overview of the English planning system • Ground rules for an easy life • What should I do first — move on or apply for permission? What is a rural worker? • Essential need • The weight to be attached to the policy • The functional need test • The financial test • Other requirements • Temporary and permanent permission • Presenting your evidence • Conditions and section 106 agreements • The live-work alternative • The barn builder’s caravan gambit • Annex A of PPG7. And here are two excerpts. 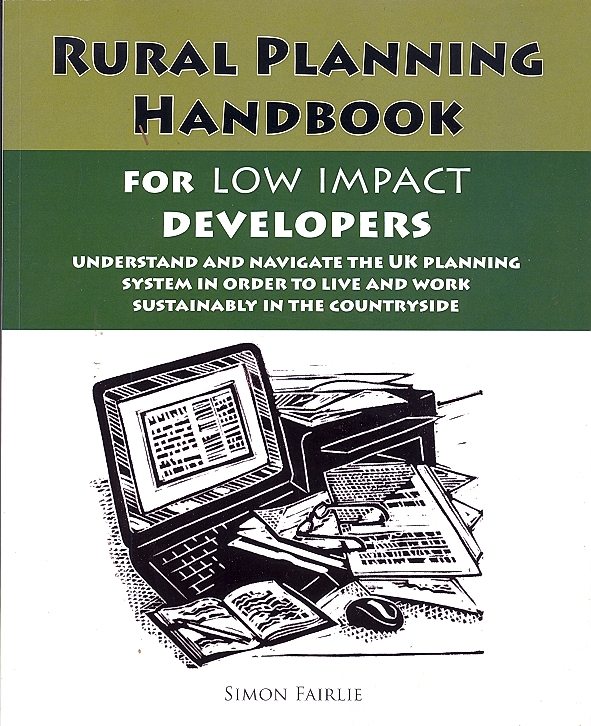 If you want to stake out a low impact home or livelihood on a piece of land in the countryside, you will probably, unless you are lucky, have to confront the planners. The best way to deal with them is to try and understand them and the system they work within. This is no easy matter. Development control planners are a very odd bunch. Within a year or two of graduating from college they get sucked into an institutional value system that is arcanely masonic in the hold it has upon them. They are bound at every step by government guidance and development plan policies, their every action is liable to be vetted by their superiors and they are subject to pressures from all sorts of vested interests. Being human, they have their likes and dislikes, but these sympathies can only be expressed through circuitous advice and perverse signals. Like a crab constricted by its carapace, they find it easier to walk sideways. The planners and the planning system are there to make you think about the way you use your land. Do you really need to live on it or are you just indulging a desire to live in attractive surroundings, that if pursued by everyone would result in the destruction of the countryside? Are you prepared to take on looking after 20 acres — wouldn’t you be better off living in a village close to the school and the shop, and gardening an allotment that won’t be ransacked by deer and badgers? Is living on your land really going to minimize your car use, or are you in fact going to use more petrol going off to part-time jobs, nipping off to a decent pub three villages away, ferrying your kids to extra-curricular activities or inviting your mates round for supper? The planning system isn’t particularly good at raising these issues (though it’s surprising how it can home in upon them in a well-conducted public inquiry). But no other social process raises them, and they are matters that should be considered by anyone contemplating a move to the countryside. The real problem is that the rich commuters who buy up all the existing rural dwellings, with their barns and pony paddocks don’t have to think about such matters at all. The Single Plot Exception Policy represents the best opportunity for anyone seeking permission to build an affordable home in the countryside through mainstream channels. This enlightened policy was pioneered by South Shropshire District Council, then taken up by the whole county when it became a unitary authority in the last series of boundary changes. The policy enables one-off self-builders to take advantage of the rural exception site policy through a specially devised legal agreement with the local authority which ensures that the house stays affordable when it comes up for sale. It means that if you have secured a plot of affordable land on the edge of a village you can get planning consent to build an affordable home without having to negotiate with the cumbersome bureaucracy of a housing association or contribute to the salaries of the professionals who staff them. You don’t need to initiate a housing survey because you yourself are the evidence of demand. In Shropshire the policy has been very successful. Between 2009 and 2015, 256 houses were given planning consent, and only two changed hands. The policy was used by the Karuna permaculture project to obtain permission for a low impact dwelling after the project had been refused permission as an agricultural dwelling at appeal (see p.9.2). A further potential advantage is that with single plots there is no question of housing density, and so there are better prospects for securing a house with access to land than there are with a multiple plot rural exception site. Karuna, mentioned above, is an 18 acre smallholding. The main limitation with it is that (like other affordable housing policies) it only applies to people with a strong local connection. This is defined differently by different councils, but living or working in the area for a period such as 12 months is often the main criterion. Local people should have priority, no doubt, but people who move around, are as much in need of affordable housing as people who stay put. The policy is described in the Shropshire Council Build Your Own Affordable Home Information Pack. Although it was introduced in 2006, and has been successful, it seems to have been taken up by only a few local authorities, for example Purbeck in Dorset and East Lindsey in Lincolnshire who have also produced useful supplementary guidance (supplied in Polish, Portuguese and other foreign languages, suggesting that some immigrants in this part of Lincolnshire are developing “strong local connections”). Mendip has a policy lined up in its emerging plan. The single plot policy, despite the emphasis on local connections, offers one of the best models for meeting the huge demand for affordable low impact homes on the edge of rural settlements. Anyone who is looking to build one should be lobbying their local authority to introduce such a policy. If there is no such policy in your local authority’s plan, it may still be worth citing this approach if you are applying for a dwelling on land that is next to a settlement (a fundamental requirement of all exception site policies) and hence not isolated (thereby potentially conforming to Para 55 of the NPPF). Refer to the policies in South Shropshire, E Lyndsey, Purbeck and Mendip local plans; and submit also the model Section 106 legal agreement securing the affordability of the house, which Purbeck provide on their website.